the cake + the knife, a love story: hey jude..
Jude Blereau doesn't know it yet, but I think I am in love with her. She is a phenomenal Australian cook, writer, teacher, cafe owner and organic pioneer and enthusiast living in Perth. If I had to take only one cookbook with me into the next life, it would be Coming Home to Eat..Saint Peter would let me into heaven based on the recipe for buckwheat and quinoa waffles or pancakes with cinnamon orange sauce alone. This is what id call a complete cookbook. It doesn't just instruct you with amazing recipes for organic, vegan, carnivorous, gluten free, dairy free meals and desserts, it also educates you about about food and how to eat it. Many books claim to do this, but their approaches are usually parochial and preachy (and boring). I thought I knew most of it when it came to understanding the healing properties of food (okay, I thought I knew it all), yet Jude's simple, beautifully written insights offered me so many missing links in my understanding. Jude teaches you about vegetables, fats, meats, beans, eggs, nuts, milks, pasta, enzymes, yoghurts, sweeteners, luscious whole grains and how to select, cook and prepare these things so that food transforms itself from merely something on a plate, into beautiful culinary concoctions that make you glow effusively with vitality and satisfaction. Even if you are a complete an utter gluttonous slob with no regard for either your health or the environment, you'll die (and go to hell) over how amazing all of her recipes taste. For those of you that haven't figured it out yet: food that makes you want to punch someone because it tastes so good, CAN be extremely good for you as well. 2 teaspoons of natural vanilla extra (I used a bean paste and was a little heavier handed with the vanilla). Preheat the oven to 180 degrees, line a baking tray with baking paper. 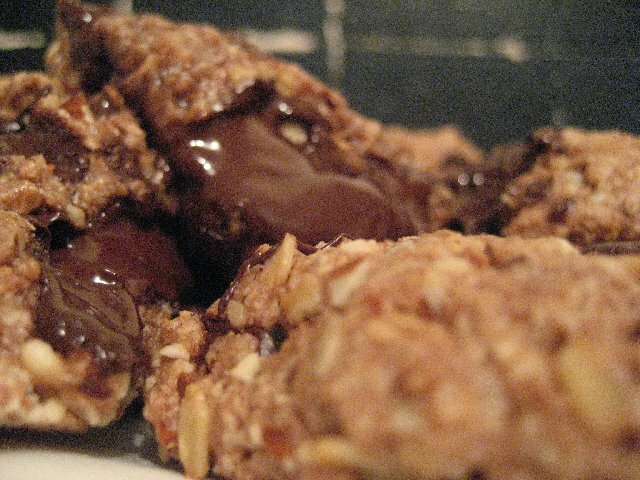 Spread the oats on the tray and bake for 5 minutes, then place in a bowl so that they don’t continue to cook. Next, spread almonds on the same tray and bake for 7-10 minutes, make sure they don’t burn. Put the oats in a processor or blender and grind to a coarse meal, then tip into a bowl. Roughly grind the almonds and then add them to the oats. Add the flour, baking powder and chocolate chips (or chunks) and combine. Mix the almond oil, maple syrup and vanilla and pour into the dry ingredients and mix it all together to form a dough. Take little balls of the dough and spread onto the baking tray. Bake for 10-15 minutes, let them sit for 10 minutes after removing from the oven…if you can. The texture of the finished product belongs in a museum, it is testament to the skill and experience of Jude’s cooking. I changed the nuts used in the original recipe from walnuts to macadamias and brazil nuts and added a more geneours amount of vanilla bean paste. Instead of dutched cocoa (which is more ideal because of its lowered acidity content), I used a 100% Valrhona cocoa powder. These brownies were superb, dense, nutty, dark and vanilla infused. 100g altogether of macadamias and brazil nuts (or any nuts you like). Get your oven firing at 165 degrees, grease and line a brownie tin. Put the flour, baking powder and cocoa into a bowl and combine thoroughly. In another bowl, mix the almond oil, maple syrup, rice syrup, sugar, vanilla and milk, then pour into the dry ingredients and combine well. Fold the chocolate and the nuts through. Pour into tin and bake for 30-35 minute. Jude advises that when done the mixture should wobble a bit in the tin if you gently wobble it, and so will your knees when you see this. Be more patient than I was, and actually wait for the brownie to fully cool before you go and do an Edward scissor hands on it. This is decadent and dark, and so beautiful because unlike other brownies, youre tasting the lightness of the vanilla, the creaminess of the nuts and the bittersweet dark chocolate, not just getting an assault of refined white sugar and too much butter. Share these with the people you like in front of the people you don’t. Coming Home to Eat is available in pretty much every book store I’ve been to recently. You would also do well to purchase her earlier book, simply entitled Wholefood, equally as wonderful as her follow up. You can visit Jude on the follow website, and if you are lucky enough to live in Perth, be the envy of me and attend her cooking school. feeding me that brownie was the best part of our friendship. okay not really, but it rates up there earl grey without a doubt. also, it was a very poorly worded comment. but i am sure you know what i meant. seeing your pudgey hands as you ate the brownie was the highlight of my frickin life! those look delicious! cool lookin' blog! btw, thanks for visiting & linking to me! seriously, the brownie was orgasmic! you're going to have to make me this thing on a regular basis now.